Kuper Yuri (b. 1940, Russia) Lives and works in Paris, New York and Moscow. Studied at Moscow Art Academy. Immigrated to Israel in 1972 and later moved to the UK. 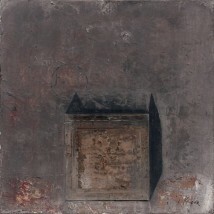 Exhibited in major galleries in France, Switzerland, UK, USA, Russia and Israel. His artwork can be found in public and private collections around the world including the Museum of Modern Art, New York. In addition to his paintings, Yuri creates jewelry, sculptures, writes plays and illustrates books.